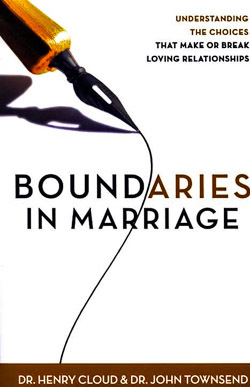 If you're looking to be counsel by the best when it comes to your Christian marriage, then perhaps you should take a look at what Dr. Henry Cloud and Dr. John Townsend have to offer when it comes to their book: Boundaries in Marriage. Here we have a book that's not only recommended by Focus on the Family; but a book that is part of Cloud's and Townsend's bestselling book series that's known as: Boundaries. Now many would say that Cloud and Townsend are at the forefront of what most would call today's Christian marriage counseling movement. Nevertheless when it comes to Dr. Henry Cloud, know that he is a well-respected orator, book author and is a radio co-host (along with Dr. John Townsend) of the nationally broadcast radio program that's known as New Life Live. As for Dr. John Townsend, know that he is also a well-respected orator, book author and psychologist. And again, Townsend is also the co-host (along with Cloud) of the nationally broadcast New Life Live radio program. Now when it comes to their book Boundaries in Marriage, Cloud and Townsend takes the time to point out just how important it is to be respectful of your spouse's personal territory. As a matter of fact, they believe that if you were to learn how to develop this type of respect for your spouse, such an approach would go a long way, in regard to strengthening one's marriage. They also hold true to the notion that having such an approach would also help to safeguard your marriage from what they would like to call "intruders." Now you're probably thinking: "What are intruders?" Well intruders, according to Cloud and Townsend, are things that are dealing with situations like affairs (and all things associated it), close relatives, and things that have over time, that have had, in a very subtle way, have become idols in your spouse's (or even in your own) life. But Cloud and Townsend goes even further when it comes to their Christian marriage counseling approach -- for they also reveal why it's okay to say no to your spouse at times. But they also share with you, why they believe it's good to be open minded when it comes to your spouse's needs and choices as well. Now if you're looking to learn how to respect your spouse's personal space, while also learning just how important that respect could be in your marriage. And if you're also looking how you can help each grow as both a team and individuals, then perhaps you should really think about picking up Cloud and Townsend's remarkable work that's simply known as: Boundaries in Marriage. Don't let things like strife, betrayal, and the lack of respect and intimacy destroy the marital relationship that means so much to you; therefore undoing the very thing that God has blessed, and has helped to put together, when it comes to you and your spouse, and the household that the two of you are building together. Learn how you can fight for your marriage and for the ones that you care so deeply about.